Diabetes is a condition that happens when the amount of glucose or sugar in your blood is continuously above normal levels. If left unchecked, it can cause other problems with your heart, nerves, blood vessels and eyes. So, it’s important to make sure your blood glucose levels are within normal ranges. If you think you’re at risk of having high blood glucose levels, or if you want to monitor your average blood glucose levels (HbA1c) , you can buy one of our home diabetes test kits online. What is a diabetes test kit? How does high blood glucose cause diabetes? 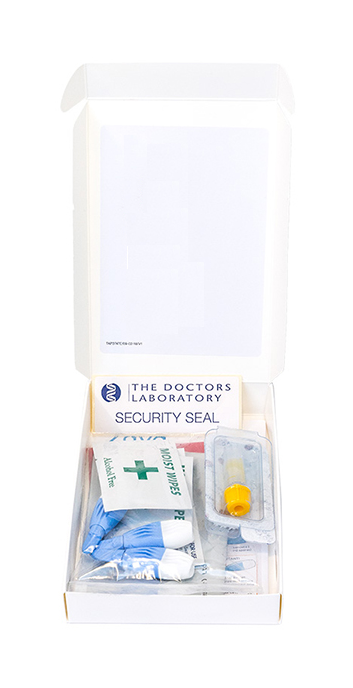 A diabetes test kit is used to monitor your blood glucose levels. It is a ‘finger pin prick’ blood test that can be taken at home, which can be especially useful if you need to conveniently check how well your diabetes treatment is working. The results of a glucose or blood sugar level test (HbA1c) will show if your average levels are at, above, or below the normal range over the last 4 to 6 weeks. For example, low glucose levels can cause a condition known as hypoglycaemia which could cause you to lose consciousness if not treated. High blood glucose levels can suggest a condition known as diabetes which could also affect your eyes, nerves, blood vessels, and heart. Both high or low blood sugar results can be dangerous and if you get one of these results you’ll need to visit your doctor for further advice. In either case, early diagnosis and treatment can help prevent damage to your body. The amount of glucose in your blood at any time is controlled by a hormone called insulin. This hormone is produced by an organ near your stomach known as the pancreas. Whenever you eat, glucose enters your bloodstream and the pancreas releases insulin. This helps move the glucose from your blood into your cells where it can be broken down to release energy. Diabetes happens when your pancreas doesn’t produce enough insulin to move glucose into the cells, or when the insulin produced doesn’t work properly, so high levels of glucose remain in your blood. If your blood glucose levels are consistently high, you need to seek medical advice to check if you have diabetes. The two main types of diabetes are type 1 and type 2 diabetes, with type 2 diabetes being more common. Usually, your blood glucose levels stay within normal limits throughout the day, but it’s slightly low in the mornings and slightly raised after meals. For people with diabetes, the blood glucose levels are often above normal limits throughout the day, unless they are using treatment. Using the Superdrug Online Doctor test kit, you can take the sample at any time of day whether you have just eaten or not. When your results are ready, your doctor will check if you’re at risk of having diabetes or if you already have diabetes. This will help them give you advice on next steps. If your blood glucose level is high but not high enough to be given a diagnosis of diabetes, this is called a ‘pre-diabetes’ stage and means you are at risk. Your doctor will suggest you regularly test your average blood glucose levels and make some lifestyle changes with food and exercise to help improve your test results. If your average blood glucose are high enough for a diabetes diagnosis, and you already have some of the symptoms, your Superdrug doctor will advise you to see your GP and start a management plan. If you have started medication treatment with your GP, and you’ve used it for at least 6 months already and you’re happy with your treatment, you can reorder repeat diabetes treatment medication from Superdrug Online Doctor. Mayo Clinic (2019). Diabetes. [online] Available at: https://www.mayoclinic.org/diseases-conditions/diabetes/diagnosis-treatment/drc-20371451 [accessed 12th March 2019]. National Health Service (2019). Diabetes. [online] Available at: https://www.nhs.uk/conditions/diabetes [accessed 12th March 2019]. Patient.info (2019). Test for blood sugar (glucose). [online] Available at: https://patient.info/diabetes/diabetes-mellitus-leaflet/tests-for-blood-sugar-glucose-and-hba1c#nav-1 [accessed 12th March 2019].